Wall Street Recap: Dow Jones up 128 points or 1% but still down 1.9% mom. 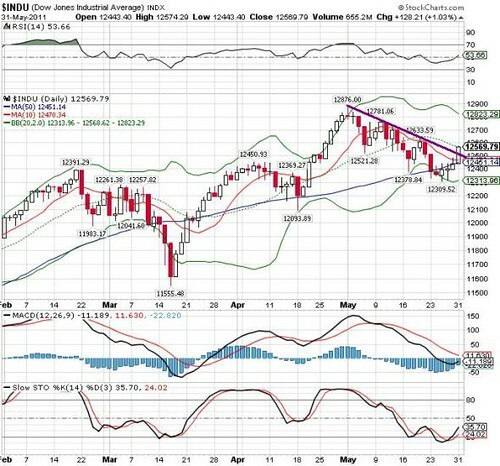 Dow Jones rose 128 points to 12570 amid speculation that EU leaders will pledge more aid to Greece next month, offsetting the weak May consumer confidence and Chicago PMI reports. The May consumer confidence fell to a six-month low at 60.8 from 66.0 in April whilst the Chicago Purchasing Managers Index fell to 56.6 in May from 67.6 in April. The remaining key economic reports scheduled for this week are May ISM and ADP employment (1 June); April factory orders (2 June) and May payroll data/non-manufacturing index (3 June).